Cables and double-points and raglan decreases, oh my! There are a lot of sites to look for patterns. Many yarn manufacturers have patterns available. Ravelry has patterns both free and for a price. (I have a profile on Ravelry, if you want to add me as a friend there.) Knitty.com does regular issues online of free patterns, and Knitpicks has some free patterns available as well. Related to Knitty.com is Knittyspin, which showcases things to knit from yarn you spin yourself. I haven’t quite gotten to that stage yet (although my dad made a drop spindle for me years ago, and I really do need to learn to use it), but I figure I can always substitute commercial yarn in a pattern, right? 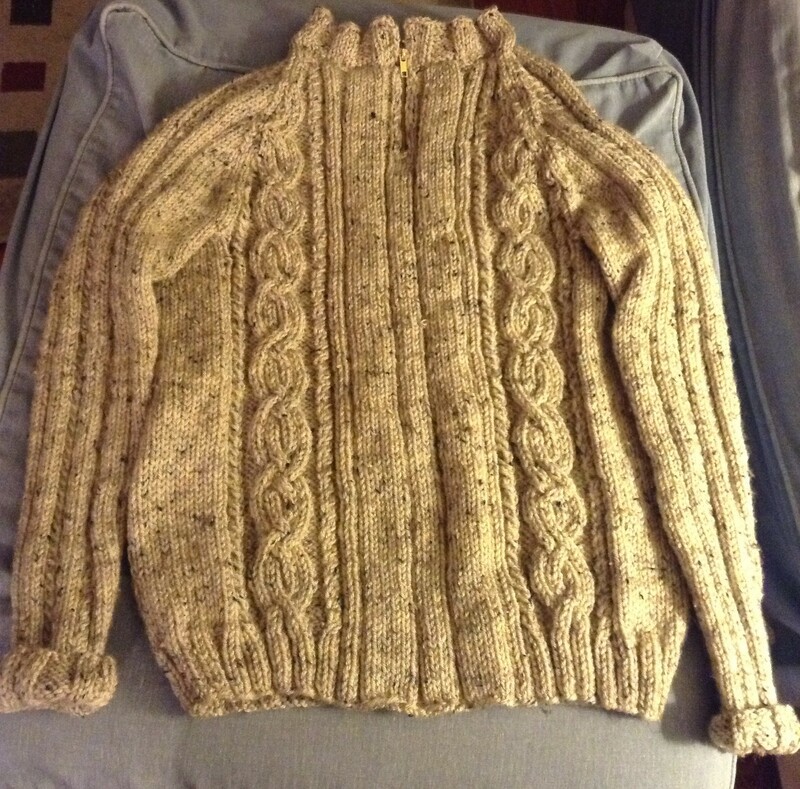 Knittyspin is where I found the sweater pattern I wound up using, Alyn. Rather than using homespun yarn, however, I went with Vanna’s Choice (Oatmeal) from Lion Brand Yarns. Using double-point needles to work on the sleeves. I’ve always done sleeves open, seaming them at the end — and working on both sleeves at the same time (a trick my mom taught me to be sure that the tension and hence the size of the sleeves was equal). These are knit in the round from the cuffs up, and my circular needles were too large to start the work on — I didn’t transfer to circular needles until I’d increased enough that I kept dropping stitches. Even then, I had to use the “magic loop” knitting technique, where most of the length of the needle isn’t used, but is held in a loop, with the stitches divided between the two ends. Using the double-point needles actually wasn’t that difficult, as long as I remembered to pay attention to where my rounds began and make my increases at the right point. The raglan decreases after joining the sleeves to the body. There was the minor problem I always have (reminding myself of the proper way to do an ssk decrease), but the real trick was continuing to work the cables in pattern and do the raglan decrease as it crossed the cables. I’m still not sure I did it as well as I could have. The lower hem. I don’t think this is something that I did wrong, per se, but the wider stockinette areas in the front don’t draw in as much as the ribbing, which makes that portion of the hem dip a tiny amount. This entry was posted in handcrafts and tagged knitting by Sara Penhallow. Bookmark the permalink. Nice sweater and very nice choice of yarn. 🙂 If his arms grow that many inches in a few months, I will be quite surprised. He’s still a little young for that much of a growth spurt. Wow! Lovely work. Absolutely impeccable achievement. I couldn’t have done it myself. 🙂 And I know your son will look so handsome in it….